There can be no doubt that the Minsk-2 agreements do provide the framework for a peaceful settlement of the impasse but there is also no doubt that the Kiev and NATO forces have no intention of abiding by its terms and are preparing for another offensive. Putin also stated, “I hope that it will not come to direct large scale clashes.” Yet, the people of the Donbas would be surprised to be told that the thousands of shells raining down on them from the Kiev junta’s artillery in order to provoke those clashes do not count as large scale attacks. Bu what is the purpose of this state of siege? Since the Donbas forces have proved their strength and resilience the Kiev regime has little hope of achieving the total destruction of those forces and imposing its will on the Donbas. Kiev and NATO also know that Russia does not want to be drawn into a direct clash with NATO that could lead to a general war. In consequence the Kiev-NATO axis have decided to engage in operations that have direct political repercussions designed to disrupt the Russian-Donbas alliance or to paralyze it and try to enlist new allies and it is noted that the western media immediately blamed Russia for the assassination to try to stir up trouble. At the same time they have decided to make the war more costly for the Donbas and Russia both in military and economic terms, and to try to bring about a gradual exhaustion of their physical and moral resistance. Indeed we see in Ukraine the expression of the Anglo-American-German political purpose: the desire to force Russia to submit to their will. They failed in World War I. The attempt failed again in World War II. The so–called Cold War succeeded in bankrupting the socialist state but the capitalist state that rose from that sad decline is gathering its strength once again and refuses to submit to any one’s diktats. And so the NATO coup in Kiev, in order to take Ukraine away from Russian influence as the Nazis tried to do in World War II. But the Kiev-NATO cabal cannot break the will of the peoples of the Donbas nor of Russia and so the constant attacks, the constant propaganda, the constant turning of the economic screws. These actions are all illegal under international law and the laws of war. They are violations of the principles and articles of the UN Charter. They are violations of several Geneva Conventions and other international treaties. The attacks on civilians are war crimes. The use of prohibited weaponry, in these attacks, is a war crime. The collective punishment of entire populations is a war crime. The use of economic warfare is a war crime. Yet nothing is done by any western government to stop it nor does the International Criminal Court lay any charges where it can. Instead it stands by and condones these crimes by its inaction. Article 6 of the Rome Statute that created the ICC states the actions of the NATO-Kiev axis constitute acts of genocide. The list goes on and is a compendium of the crimes being committed by the Kiev-NATO axis powers in Ukraine. But it is not just a “provocation” for in concert with the assassination the Kiev regime has begun troop movements near Donbass lines. It also seems to be a prelude to further military action. “After the terrorist act, we’ve registered the movements of troops along the Line of Contact,” said Eduard Basurin, a representative of the DPR Operations Command. “The Ukrainian forces were put on alert for combat training. When the Minsk Agreements were signed in 2015 it was doubtful that the Kiev-NATO axis had any intention of using it except as a means of pausing their operations in order to reorganise and prepare for the next offensive and so it seems to be. The only way forward is to resolve the conflict at the political level on the basis of the recognition of the right to self-rule and autonomy for the Donbas republics, the creation of a federal state to assure ethnic stability, and the commitment by Ukraine that it will be a neutral state and not part of any plan to “contain” Russia, a plan that can only lead to world war. But the NATO puppets in charge of Ukraine do not act in the interests of Ukraine. They act in the interests of the masters of war who have no concern for humanity in general or Ukrainians in particular and if they continue their operations they will not succeed in uniting Ukraine but only in laying it waste. 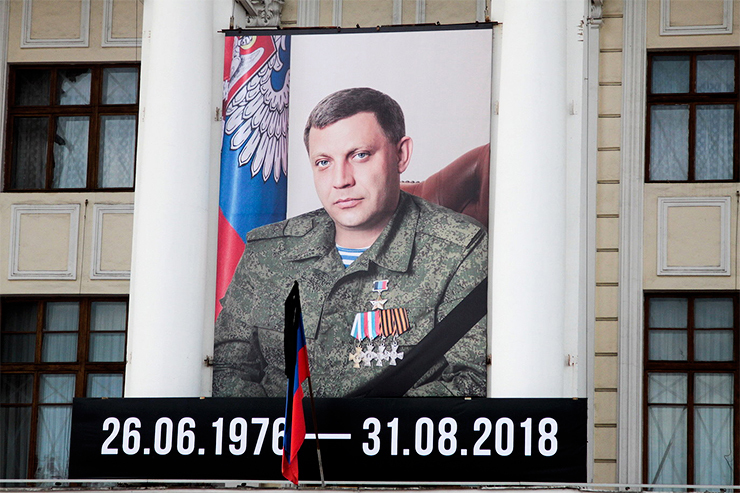 The assassination of Alexander Zakharchenko, a crime that should be condemned by the world, is a message from NATO to Russia, that instead of living in peace, as quietly flows the Don, to use the title of Sholokhov’s novel, the people of the Donbass can expect only more war, for a hero is dead, and bloody flows the Don.